As I matured, it occurred to me post-discussion that often groups of people had not really been talking about what it seemed we were ostensibly talking about. In book groups their conclusions puzzled me. It was as if while I was discussing the text, they were shopping at Nordstorms; holding up some piece of information or impression to see if it were ‘okayed’. Moreover, later I suspected that they didn’t really know that they weren’t talking about what they were talking about. (Definitely, I was puzzled what they were talking about.) Whatever! I also suspected that they weren’t having the feelings which they reportedly felt or felt that they had felt. Their feelings just didn’t ring true to me. And as I aged out, I also realized that many of my teachers hadn’t lived the advice that they offered, and suspected also, that they hadn’t realized that they weren’t living the advice that they offered. So often, in fact, their advice was the direct opposite of what they were doing. Didn’t they notice? What the hell? Have you ever crafted a very reasoned response for a discussion others are a part of, to find they listen and then carry on without a remark as if nothing had been said – as if you were a spirit which had drifted through the room, shrieked – and left, without a mention? As an artist, have you watched artistic leaders make the most preposterous assertions without a blush to a fully accepting crowd? If you have ever considered the artistic community – or any community, for that matter – and come away dumbfounded regarding something or other – this might be the book for you. As I type this, I am still incredulous that after all of the time I have spent in the art world, trying to find my way, and trying to understand the art world, that it never occurred to me to read what a sociologist would have to say about the art world. That is, of course, they would study these things! Well. I’m certainly late to the game, but feel I’ve arrived. Because, Typing and Sales 101 are two courses I’ve always felt should be in any practical educational curriculum. Now I would have to add a third, and that is a study of the book, Art Worlds by the sociologist Howard Becker. Howard Becker’s book is fundamentally about ‘conventions’; about a conventional thought, about a conventional activity. Art Worlds discusses how humans utilize convention to organize and to ‘regularize’ production, so that in a professional arena, not everything need be discussed. This is the bread and butter of Becker’s work. In fact, very little of any accepted convention must be discussed. Because the sources of conflict have already fought their nasty little internecine wars and spawned conventions which have been codified as standards, long before you ever arrived, or perhaps were even hatched and people do their work amongst them like fish swim in water. Dissenters have long ago been herded off (and actually continue to be ‘hauled off’) and penned somewhere ‘beyond the pale’. These conventions determine the flowcharts of nearly all social organizations. But they are very apparent in the arts where it is quite necessary that something nebulous be defined so that it might be crafted and produced and then be ‘authenticated’ (which is in the art world a way of being ‘realized’) in order to be understood and sold to its consumers. “Art Worlds” examines just this. But as Becker notes, “the world of art mirrors society at large”. What would look to be a good book for any aspiring art worker to study – actually, is a good book for any aspiring human to study. That is, if you would like to get on in life. This is all about getting on in life. Becker makes no aesthetic judgments. It’s important to uphold standards. When an arts organization tells you that they “must uphold standards”, they really can’t emphasize this enough. Because the life of the organization, their jobs, their professional status and their livelihoods all depend upon meeting the specifications of the art product they produce. Not to do so would be like a blind Sampson pulling down the pillars of the temple. Becker doesn’t theorize; he observes. “…sociology does not discover what no one ever knew before… Rather, good social science produces a deeper understanding of things that many people are already pretty much aware of.” Becker, as sociologist, explains the functioning of an Art World in a way that those who understand only a part of it can’t. Becker begins his book by noting that “art is social”. That whereas we commonly think, in our culture, as the artist being the creator of the work – Becker goes to great effort to describe the community of ‘personnel’ who, taken together, produce the ‘art’ product. Further, he shows how the art cannot attain any stature without this community of ‘personnel’. Nor, can it even claim to be ‘Art’. As Becker observed, “Most history deals with winners. The history of art deals with innovators and innovations that won organizational victories… (my italics) Only changes that succeed in capturing existing cooperative networks or developing new ones survive… Art worlds routinely create and use reputations.” Art worlds regularly criticize and defend themselves, authorize membership and reject aspirants. And they all define themselves, their places and their actions through an establishment of ‘conventions’. It’s a personal belief of mine that any true appreciation of reality is an ‘unmooring’ experience. T.S. Elliot remarked, “Most people cannot stand too much reality.” In truth, most of us fight the Alice in Wonderland, topsy-turvy quality of reality. We really cannot stand to be a part of this. We’d rather manufacture something with more stability. “That is our story, and we’re sticking to it,” is rather the nature of how we go about it. So a book like Becker’s “Art Worlds” – which can leave this artist/reader feeling unmoored – to my mind, is quite a book indeed. Every time I come across an article or poem by Tony Hoagland, I either turn to it immediately, or savor the thought as I thumb my way through. He is smart, witty, enjoyable… and in his bio photo looks as I would imagine a leprechaun would as it had just cast a spell and/or achieved a little mischief with words. The truth, for Mr. Hoagland, is mischievous. I have no higher praise. the light through the bedroom window is too strong. when the dreams inside my head are still wet paint. Reads almost like some monologue in a movie full of warmth and oddities – doesn’t it. Tony makes me wonder if they haven’t a stable of poets somewhere on the movie backlot, who drift from light comedy to light comedy sprinkling bits of fairy enchantment. His stuff just feels like it’s been around; never borrowed, but wise. All of the good books aren’t necessarily the new books. Grubbing through the Olde Book Store, an enterprising reader can discover many treasures. 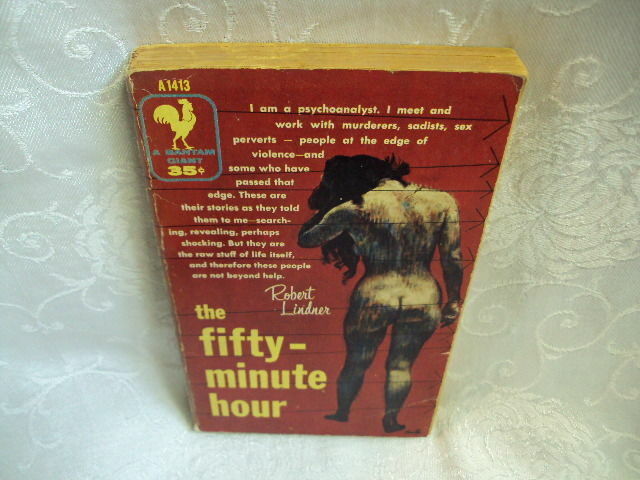 The Fifty Minute Hour by Robert Lindner is such a book. I must have first purchased it used. (Okay, partly perhaps because of the lurid cover.) Then, I uncovered it again while unpacking from a recent move. It looked interesting all over again, so I began reading. When you read a book of a past era you find things that are spoken of and wisdoms imparted which you will not find in books of the present era. Different environments hatch different people. If it is a good book, you will find yourself missing the entire period as if you’d lived then. The story is of a brilliant scientist who – while otherwise quite normal and engaging – is sent to the psychiatrist because of the mad belief that he visits other planets (where he rules, of course). The psychoanalyst, after failing and abandoning all other strategies, decides that what is needed is for him to immerse himself likewise in the delusion. The rationale is that two psychoses cannot inhabit the same space. One will inevitably ‘call out’ the other. In psychoanalysis this is called the principle (and strategy) of “participation therapy”. Perhaps you can imagine what happens? Our contemporary culture is quite adept at sniffing out what we would like and supplying it. You participate long enough and you will find that our culture has located an area in you vulnerable to addiction – as you begin to feel the uncontrollable pull. What our psychoanalyst finds is that if you filter your way through enough psychosis, it is likely you will find one which can harbor itself – finding a personal vulnerability – in you. None of us is that far from going mad, is what this tale has to say. You are currently browsing the archives for the The Short Version / Reviews category.